Selvfølgelig måtte New Yorkeren Steve Earle kalle sin sønn Townes, Justin Townes Earle. Man kan bare krysse fingrene for at Justin selektivt arver Townes van Zandts egenskaper. Nå har Chicago-selskapet Bloodshot Records skrevet kontrakt med unge Earle og debutalbum kommer i løpet av våren. 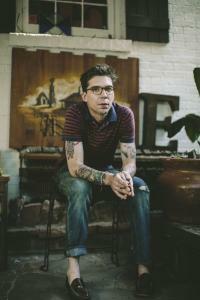 Bloodshot Records is pleased to announce a multi-album, world-wide agreement with Justin Townes Earle. His debut full-length album, The Good Life is slated to hit stores in Spring 2008. Justin will make appearances at SXSW and tour with The Felice Brothers in March and April. With Justin Townes Earle’s pedigree comes mixed blessings. As the son of legendary singer/songwriter Steve Earle, high expectations are the name of the game; but he’s shown that he is up to the task, crafting stark portraits with elements of acoustic blues and folk. After a misspent youth in bluegrass/ragtime combo The Swindlers and the louder, more rocking The Distributors, the 25-year-old cleaned up his act, dropped his self-destructive habits and began to focus on songcraft. With inspirations as diverse as Townes Van Zandt (he was named in honor of the elder Earle’s hero), The Replacements, Ray Charles and The Pogues, Justin forged his own brand of American roots music. His self-released EP Yuma received great notice in Nashville Scene, Leo Weekly, The Bohemian, Twangville and others, attracting the attention of Bloodshot Records. Look for Yuma to become available in wide release through Bloodshot soon. The Good Life is produced by RS Field, who has made his mark on critically acclaimed albums by Billy Joe Shaver, Sonny Landreth, Webb Wilder and Buddy Guy. Recording is underway at House of David studios, the legendary room that has hosted sessions with George Jones, Yo La Tengo, Elvis Presley, Neil Young and countless others. Joining Earle in the studio are a cast of all-star players including longtime cohort Cory Yountes (Bobby Bare, Jr) on banjo and mandolin, pedal steel player master Pete Finney (Dixie Chicks, Patty Lovelace), bassist Bryn Davies (Patty Griffin, Guy Clark), drummer Bryan Owings (Buddy Miller, Shelby Lynne), keyboardist Skylar Wilson and fiddle player Josh Hedley.